With the end of the Destiny beta on Sunday night, another public beta for a huge, hotly anticipated game has come to a close. Public betas for large games are becoming more and more common as titles not only serve bigger and bigger audiences, but as developers experiment with new platforms and do away with the barriers between on and offline play. Beta tests serve a few purposes: First, they let the developer test their product, doing what they can to make sure it won't break when millions of players roll in all at once. For players, it's simply a chance to play a new game they're curious about. A beta test that goes smoothly also serves the publisher by acting as a promotional tool, a demo that has a limited lifespan. 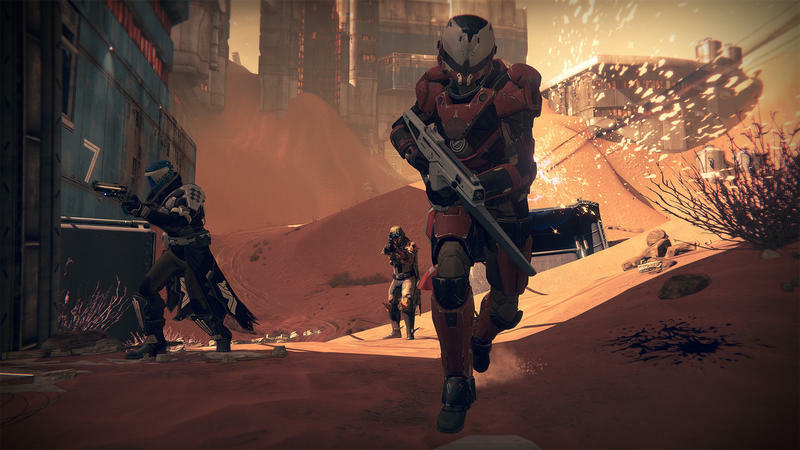 Destiny's beta fulfilled all three of those purposes as well as anyone could've hoped. We spent the last week playing it. If you didn't get the chance to play, or maybe even wanted to keep yourself on media blackout until the game hits to avoid spoilers, read on to find out what we loved and what we weren't too keen on. I think, for me, the biggest surprise and most impressive bit of the Destiny beta was its sheer stability. Granted, this isn't the full launch of the game, but Bungie managed to open the beta up publically towards the end. In the whole span, even once the public at large hopped into the fray, I was only disconnected once. That's it. I've been hurt more by lesser hyped games, and Bungie's ability to beat the hype with stability, so to speak, really impressed me. I think one was the magic number for me, as well. Connections were speedy and only a few very brief moments showed any sign of lag despite the huge influx of players. Everyone who participated had three codes to give away to start, and then they threw the doors wide open. You and I both played on PlayStation 4, we should mention, so we don't have any direct knowledge of other platforms, but word seems similar. Smooth launches like this are getting really important not only because so many games are blending single and multiplayer but also because when someone botches it – not going to call out Electronic Arts specifically, here – it's a huge problem that can make a game unplayable for weeks or months after launch. Just by mastering stability, Bungie has done a lot to raise gamer confidence in the game and the services behind it. It's sad, but a working server, regardless of the game, is really appealing right now. "What are you most excited about after the Destiny beta?" they ask. Since getting into the game went so smoothly, it wasn't long before I was staring down the the sight of an auto-rifle, blowing away Dregs, Captains, and our favorite enemy, Wizards (who come from the moon). As expected from an experienced developer of shooters, shooting is fun and feels really good. There's a good variety of weapons and weapon effects on display even in just the beta. My only problem? I felt like I spent more time reloading than shooting. This was especially true with the hand cannons – revolvers, essentially. Rather than adding a tactical element to the game, it just slowed things down. Alternate weapons and melee attacks helped, but only so much. Right. I looooved the shooting. Felt it was spot on, especially for a game that some could argue is very MMO-esque. The shooting and firefights all felt really good, something you'd almost expect of Bungie at this point. Reloading, while I guess it didn't bother me in every single fight like it bothered you, was only really noticeable during boss battles. Bosses, beyond the Wizarddddddddddddd (dot com), amounted to little more than dodging and firing into a bullet sponge. Bullet sponges, when you reload 50 times in one fight and actively have to seek out more ammo after firing 300 successful shots into a weak point, don't make for good bosses. That's not good game design in my book. That needs to be trimmed, and hopefully Bungie will drop the hitpoints for these bosses and make them tougher to battle instead of spongier. Bungier should be less spongier. I'm proud of that. For years, developers have been trying to get massively multiplayer shooting just right, and it isn't until very recently that they've managed to get the mechanics working. The mission structure, though, still reeks of MMO. You've got story quests, fetch quests, public events, and boss runs. A lot of these are actually pretty fun, but I wanted to pick on one mode in particular that I wasn't a fan of before we talk about the good stuff. The Strike mission. You and I played this mission at E3 this year, and had a good time with it. We were fighting a giant spider-like mech that managed to drop us over and over. The guy from Bungie told us we were one of the better groups he'd played with, though I'm pretty sure he says that to all the journalists. We were at what we thought was the end boss when time ran out during that demo, and I was having a good time, so I was excited to see the mission back in the beta. Yeah, that spider mech isn't the final boss. By the time you and I failed the mission, we'd dumped what, almost 90 minutes into it, only to be set back to the beginning of one of the battles? I don't know about you, but I don't often have 90 uninterrupted minutes available to play an unpausible game with very few down moments. I don't know if it was quite 90 minutes, but, yeah, it was a very long time. And the thing about the boss? We'd figured it out quite quickly, it was just a matter of shooting at it enough to win. That was my big problem with the Strike. It was a cool and interesting mission, one that produced some actual enemy variety into the mix. That variety came at the expense of, again, a bullet spongy boss. I liked the Strike, though. I especially liked the special mission that took place on the moon. I'm not sure if you were able to play that one, Eric. You had to be on at exactly the right time in order to get in, and it included an interesting story sequence. The boss there, while tough, was significantly much less obnoxious than the two in the Strike on Earth. There is, therefore, hope. Aside from Strike, missions were mostly well-crafted. They kept us moving, they worked well alone or in groups, and they weren't too repetitive. I am concerned, however, that too many players on a server could make some of these missions difficult. More than once, you and I found ourselves waiting for enemies to respawn so we could accomplish the next task in the story. Beyond that, the other thing that really struck me (heh) was the look of the game. Sure, yeah, 1080p on the PlayStation 4 and all that. Looked wonderful in motion. But, truly, the art design here was really great. From the characters to the locales and the badges and emblems. Everything in the world of Destiny looks so strong and purposeful that it made me want to invest myself in the world that much more. The Tower, the main hub in the beta where you head to collect rewards and purchase things, looked out over the last human city on Earth. That city has the giant ball (the Traveller) floating above it. Every time I went to the Tower, I paused a minute or two to look at that vista, and that was a pretty cool experience. This is, without question, one of the best looking games out there right now. Characters seem to fit into the world, rather than sticking out. The environments – both The Tower and the dilapidated structures – feel not as if they were built to look worn down, but built and then eroded over time. While character interaction is usually handled like an MMO – walk up to this guy, press talk, jump around the guy in circles – the voice acting is good. Despite the heckling we gave the initial show of Peter Dinklage's voice, I enjoyed his presence in the game and I'm hoping his AI gets some character development, as he acts pretty human quite a bit of the time. The beta has me just curious enough about the story that it'd be a tough one to skip when it hits shelves. Yeah, I think that's a good way to put it, and I'm sure it's exactly what Bungie was aiming for. Our interest has been piqued, you know? I'm not ready to swear that Destiny will be the biggest game of the year this holiday; however, I'm into it. I'm excited for the full version, and I'm likely going to grab it when it drops. If that excitement lives on through playing? I don't know. There's a lot of game here, hopefully. The competitive multiplayer, which we got a brief touch of, looks like it's going to be strong as well. It'll depend on the full scope of the package. Will it be enough to engage users in the long run? Will Destiny be big enough? That's what I'm waiting for now. I know it will work, but how about its scale? And I think that's about the only question remaining and the one the beta can't answer. I heard from someone that the player level caps out at 20, and we managed to get to 8 in just a few hours in this one area of the game. If that's at all indicative of the scope of the game, that might be an issue, but I suspect leveling was sped up to that players could try out more powers and equipment. Between the Cosmodrome and the Moon and Venus multiplayer maps, I'm excited to see what Bungie has in store for us when Destiny hits shelves on Sept. 9.